This large contemporary courtyard house nestles into the landscape. 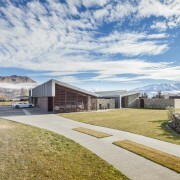 Schist stone walls and folded roof forms mimic the craggy mountains beyond. The house was designed by McCoy and Wixon Architects. Exposed locations come with great views, but they can be compromised by strong winds it's as though you can't have one without the other. 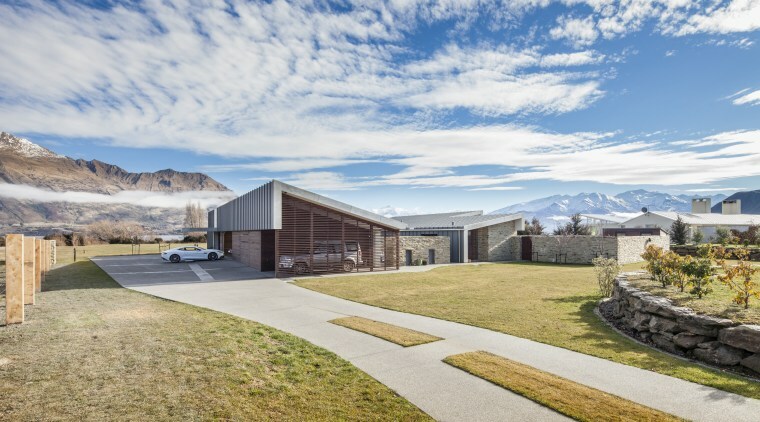 The architect of this new house in Wanaka came up with a tried-and-true solution he designed a courtyard house with high schist walls that provide sheltered outdoor living areas. 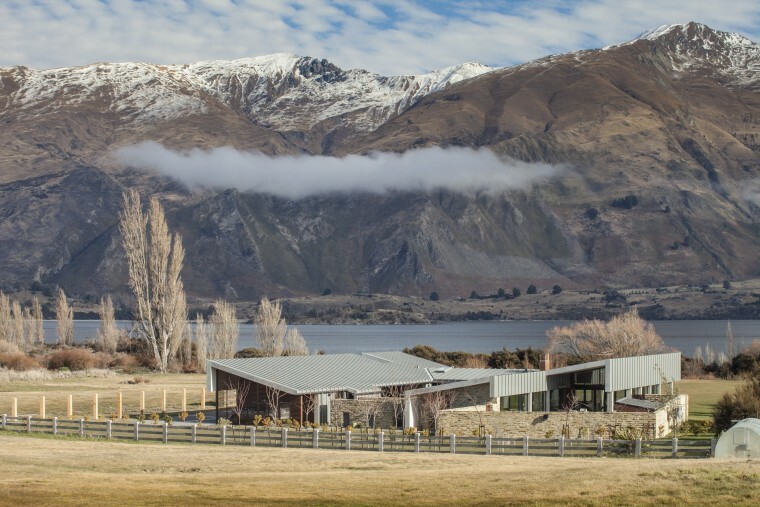 But at the same time, he created huge expanses of glass to maximise the great lake and mountain views to the north and added a terrace on this side of the house. Architect Hamish Wixon of McCoy and Wixon Architects says the views and the need for shelter were the key influences for the design. 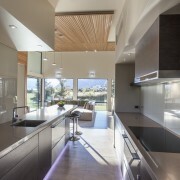 So, too, was the need for a highly contemporary home, which was requested by owners Ross and Bev Middlemass Ross owns Stewart Construction, which built the house. With this in mind, the house was conceived with three wings a garage wing, another wing for guests and one for the owners. One courtyard links two of these wings and another accommodates the main alfresco area and a pool. The sense of enclosure is further enhanced by mono-pitched roofs that soar upwards, then turn and wrap down the front of each wing. In places the aluminium runs right down to the ground, providing a modern contrast to the cedar and stone cladding. 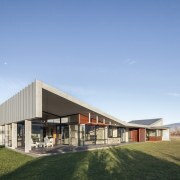 The schist walls and the way the roof echoes the fractured peaks of the mountain range beyond, help the house settle into the wider landscape. The entry to this house is defined by a large cantilevered canopy in aluminium. The wing at the left is devoted to the garaging. The house was designed by McCoy and Wixon Architects. Simplicity defines much of the architecture,starting with the entry, which is signalled by a cantilevered canopy. This appears as a solid strip of aluminium that has peeled off the roof at 90°. The entry is at the end of the garage wing, which features a long wall of flush cedar doors that create a seamless timber exterior. An internal glass walkway leads from the entry towards the main living area. It passes alongside the first courtyard there are views back into the large garage, which has glass walls fronting this courtyard. The walkway also passes the guest wing, master suite and study to end in the large open-plan family living space. Here the main circulation areas feature suspended cedar ceilings and wall panelling. As well as helping to link the inside with the outside visually, the cedar provides acoustic insulation to offset the hard floor tiles. Two living areas are provided one, which functions as a media room, has a schist wall with a fireplace. All these rooms have floor-to-ceiling glazing, with the open-plan area opening out to a sheltered contemporary-style loggia within the pool courtyard. This provides shelter from the sun and rain, as well as the wind. 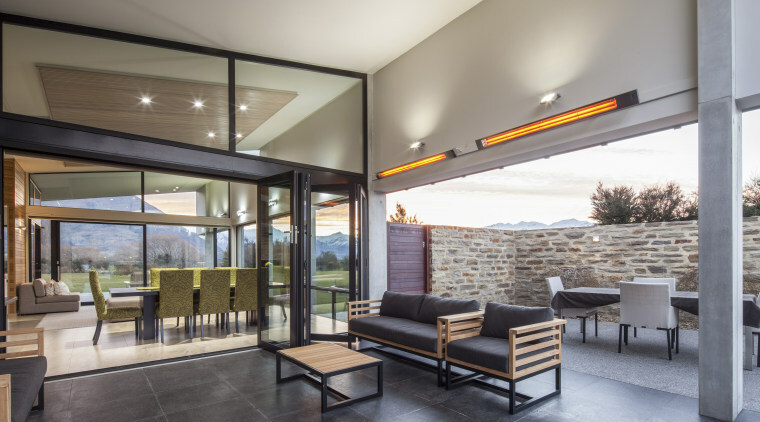 "The extensive glazing ensures there is always a view through the house to the lake and mountains beyond," says Wixon. "Large sliding cedar shutters on the north side can be pulled to screen the sun if required." Floor-to-ceiling windows are triple glazed in this house in a region that has cold winters. 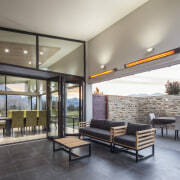 Bifolding doors open to a large, sheltered loggia-style seating area in the main courtyard. The house was designed by McCoy and Wixon Architects. Ross Middlemass says the house features above-standard insulation, to cope with the temperature extremes. Most of the windows are triple glazed; the insulated walls have 200mm insulated framing; the ceilings feature three layers of insulation; and the flooring incorporates a 100mm polystyrene layer plus 200mm concrete heat sink with underfloor heating throughout, including in the garage. 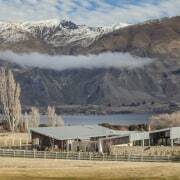 All the heating, including the swimming pool, is powered by a commercial heat pump unit. However, Middlemass says on a sunny day in winter, no heating is needed. "The house is comfortable right through all seasons, from mid-summer to winter."